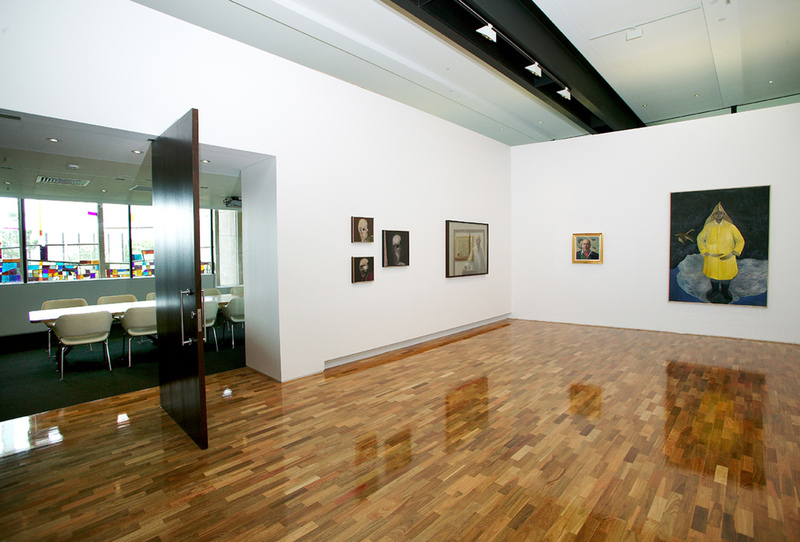 Within the concrete and glass walls of architect Robin Gibson’s original Mayne Hall a dramatic timber clad insertion provides display space for Queensland’s second largest art collection and Australia’s first National Self Portrait Collection: The James and Mary Emelia Mayne Centre. The project realises the intentions of many of the university’s early masterplans to have an Art Gallery in a prominent location on campus. Mayne Hall opened in 1973 and named in recognition of the generosity of donors Dr James O’Neil Mayne and his sister Miss Mary Emelia Mayne, was originally designed by Robyn Gibson. For 25 years the building had played an important role in university life as the venue for graduations, concerts and examinations, however declining public use and insufficient space for graduations provided an opportunity to address the need for a new facility for the Art Museum. The client’s agenda for the project was to provide a facility to support the Centre’s mission to promote the University Art Museum and the self-portrait collection, foster awareness of Australian contemporary visual culture and to present an innovative and viable public program for the benefit of the University and wider community. This meant building a facility to museum best practice for climatic and security control, to preserve the growing collection and enable access to more significant loans from other institutions.